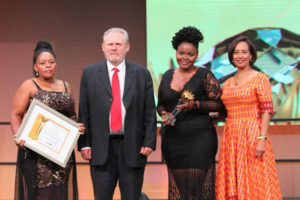 A Boksburg-based Gauteng company scored a double when it scooped two awards at the fifth edition of the South African Premier Business Awards. Winners were announced at the awards ceremony that was hosted by the Department of Trade and Industry (the dti) in partnership with Brand South Africa and Proudly South African at the Sandton Convention Centre tonight under the theme Rewarding Business Excellence. Thata Ubeke Manufacturing which manufactures electrical and electronic sub-systems for the domestic and export markets romped home with the Black Industrialist and Manufacturer Awards. It was for the second time in a row that the company won the Black Industrialist Award. The award is for companies with a high level of black South African ownership and operate in a manufacturing sector identified in the Industrial Policy Action Plan (IPAP) as key for the growth of the SA economy. Sumitomo Rubbers South Africa, a tyre manufacturing company, also won two awards at the ceremony, namely the Enterprise Development Award and Investor Award. CEO of Proudly South African, Mr Eustace Mashimbye said: “Apart from our own Proudly South African prize we are delighted to see another member company amongst the winners. We acknowledge all the companies that fly our flag and work to build local procurement levels, in so doing creating jobs. We congratulate all the entrants and especially the winners”.